The Dead Sea is known for being a unique spot and a top tourist destination: after all, the light turquoise lake is the lowest point on Earth, it is one of the saltiest bodies of water in the world, it is surrounded by a beautiful mountainous area, and its mineral-rich water and mud are known for their numerous health benefits. Visitors can enjoy staying at the many hotels in the area, visit attractions like Masada and the Ein Gedi nature reserve and get relaxing treatments at luxurious spas. However, in recent years the ultra-salty lake has become known for a curios phenomenon. Suddenly, large sinkholes started appearing along the coast, swallowing up roads, power lines, structures and parts of beaches. The danger posed by sinkholes has caused whole areas to be fenced up. To stop this phenomenon from harming tourism and the livelihood of residents of the area, scientists and policy makers are trying to find a viable solution. So what are these sinkholes, and how do they form? People have started noticing the Dead Sea sinkholes in the 1970s, but back then they weren’t as common. Only in recent years have they started to spread. Currently, there are over 5500 sinkholes in the Dead Sea, most of them on its western shores, and more sinkholes are rapidly forming. If you’re asking yourself “how large are sinkholes?” or “how deep are sinkholes?” you might be surprised to learn the answers: the Dead Sea sinkholes can reach a diameter of 40 meters (131 feet) and go as deep as 25 meters (82 feet). Occasionally, two or more adjacent sinkholes combine to form one huge sinkhole. How does a sinkhole form? Sadly, the forming of the Dead Sea sinkholes was brought on by human activity. In general, while sinkholes can form naturally, they can also be brought by such activities as changing water-drainage patterns and developing new water-diversion systems: these changes cause the ground to collapse, resulting in a sinkhole. This is what’s been happening at the Dead Sea. In the past decades, water has been diverted from the Jordan River, which feeds the Dead Sea, and minerals have been being mined from its southern shores. The Jordan River used to provide the Dead Sea with 1.7 billion cubic meters (450 billion gallons) of water, but these changes have made this amount drop by 80 percent. This has caused the sea’s surface to recede at a rate of 1 meter (3 feet) per year. 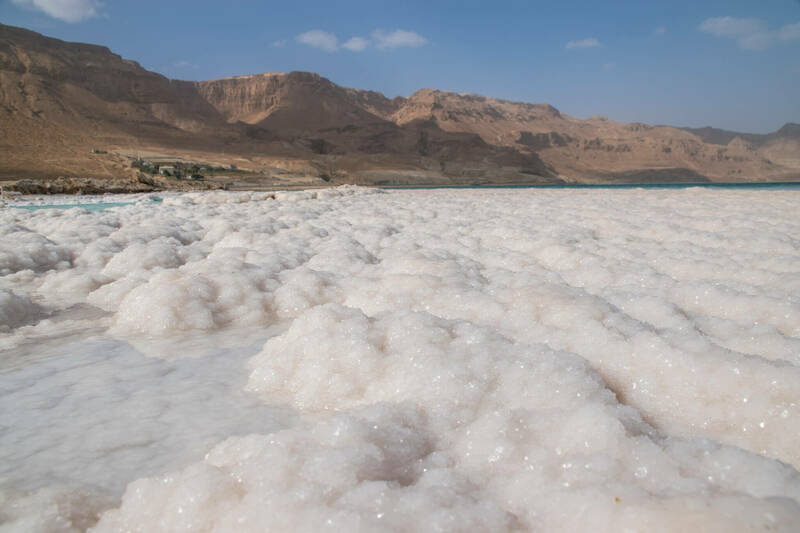 The receding waterline causes fresh groundwater to well up, and this water dissolves the layers of salt forming the ground around the Dead Sea. Thus, big underground holes are formed, which eventually cause the ground above to collapse – creating sinkholes. Can the sinkhole phenomenon be reversed? Since the sinkholes are debilitating the area, harming tourism and posing dangers to humans and animals, several ideas on how to stop the phenomenon and reverse its consequences are being looked into. One idea the authorities have come up with is constructing a canal which would begin at the Red Sea and end at the Dead Sea, bringing it salt water so its water levels rise again and stopping the welling up of fresh water which forms sinkholes. However, until this plan is put into action (if it will be indeed put into action), sinkholes will keep forming more and more rapidly. Hopefully, action will be taken soon, or else, in the future this beautiful, rare spot will be out of bounds for visitors and residents alike.